An unused corner of his living room meant a new aquascaping opportunity for Deputy Editor Jeremy Gay as he unveils his latest fishkeeping project. Since I moved to Peterborough two years ago my fishkeeping brain has been in overdrive. I've set up a fish house, two ponds, numerous tropical and marine tanks and even a polytunnel. I've nearly crippled myself moving buckets of water and RO drums around, and I swear the next pond I dig I will use a digger as I get back ache just thinking about swinging another spade. But last week my latest project turned up - a shallow rimless aquarium from Aquariums Ltd, sited on top of a custom build minimalist cabinet from Aquarium Cabinet Solutions. Faced with the prospect of squeezing another aquarium in under the stairs, I opted for a custom build, with tank and cabinet made to my specifications. When it comes to tanks I've had them all, from hexagons, bow fronts and spheres to all glass, systemised and everything inbetween. But when it comes to which tank had the most impact on me, hands down, it's the OptiWhite. Let's face it, every tank has its flaws. It may not come in the colour or style that you might want, the fitted filter and lighting might need modifying or those stress bars might be preventing you from fitting that skimmer. But get a braceless tank and there isn't anything not to like. The absolute minimum of clear silicone has been used along with the creme de la creme of aquarium glass, low iron OptiWhite glass, which is clearer than normal aquarium glass and has a slight blue hue on the edges as opposed to the usual dark green. Remove all the usual distractions such as silicone, tank rim, hood, or trim top and bottom and your aquarium virtually disappears, becoming a transparent display case for what's inside. View from above as well as the usual front-on vista, and you see a different side to your fish too. But me being me, I wanted to push the boundaries a little further. Over recent years a few ideas have gelled together, making me change the way I think about tank design. Small fish naturally live in shallow water, aquascapes look better in wide tanks and shallow tanks are easier to light and maintain. (It might have something to do with the fact that my stairs prevent me having a tall tank there too!) Behold the shallow rimless! 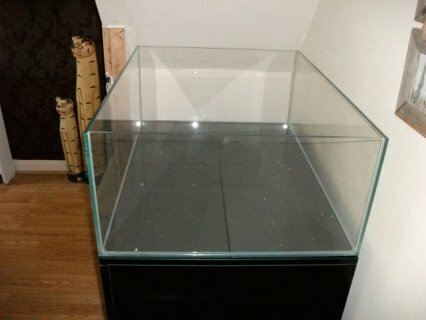 With the OK from the other half I ordered an 80cm long x 30cm high tank, but 60cm front to back! The result, a tank that is twice as wide as it is tall and I think it fits the space really well. And when it comes to cabinets I'm really picky. New company Aquarium Cabinet Solutions (ACS) approached us with a whole load of new designs, colours and finishes so we set about getting a custom design from them. Fresh back from Interzoo in Germany we wanted a wide tank and were wowed by the clean lines and glass finishes of the Italian tank manufacturers on display over there. The result - a gloss black cabinet in high gloss finish with push open doors, and fully sump ready with removable support and ventilation for the inevitable time when I go marine again. No handles, no wood grain finish, no tacky trim and like with the tank, less is more, with nothing not to like. We got it built taller too to make up the height of the tank, and ensure that the tank is at eye level when sitting down viewing it. So now for the big question. What would you put in it? Fresh or salt water, planted or rift lake? The final choice will be small fish only as I want it to be a luxury home for small fish as opposed to a cramped home for bigger stuff. Let me know what you think of the new shallow rimless tank, and what you would put into it. Do you go for the unconventional and what would you design if given the chance?